Before Carmen was one of the most famous operas in the world, it was something completely and utterly new. A daring story by a relatively unknown young composer, it broke the conventional rules of the genre and introduced the world to some of the most compelling operatic characters ever created. The world premiere in Paris, on March 3, 1875, caused an uproar among audiences and critics, and initial reactions teetered between shock and fascination. But Carmen soon gained admirers in Paris and beyond. (Tragically, Bizet died suddenly at the age of 36 just three months after the opera’s premiere, and never lived to see its success.) An acclaimed Vienna production later in 1875 was followed by performances across the European continent. The first U.S. performance took place on October 23, 1878 at the New York Academy of Music. And in January 1879, Carmen reached Boston. What was it like to hear Carmen for the first time? We can reconstruct a number of rich details about the opera’s local premiere from the historical record: what it felt like to step into the Boston Theatre, why audiences flocked to hear the famous diva in the title role, and how local critics responded. Armed with this information, modern-day operagoers can put ourselves in the shoes of first-time listeners and imagine how thrilling that experience must have been. 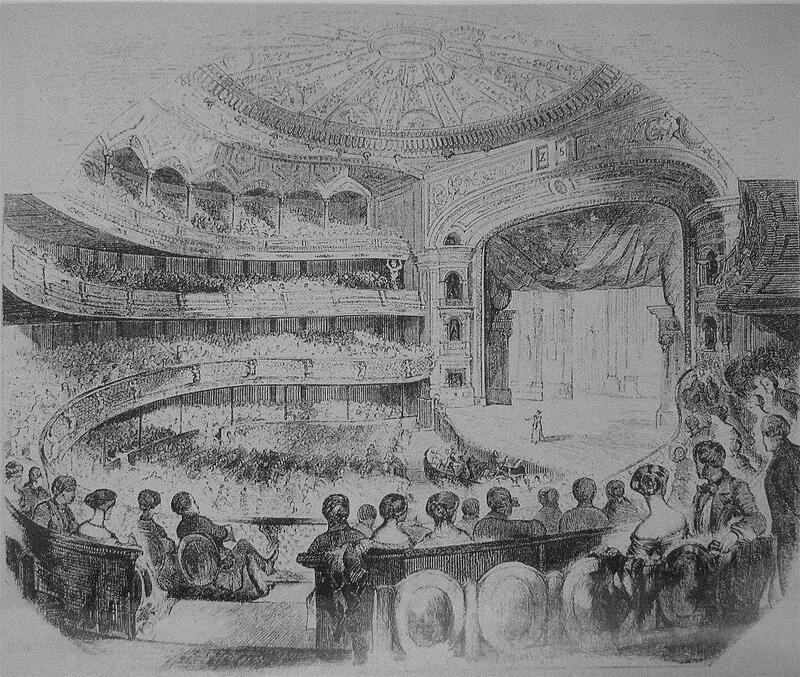 Remarkably, Boston’s first performance of Carmen took place in a theater at 539 Washington Street. That’s the same location where the Boston Opera House now stands, and where BLO’s Carmen will be presented this season. So while it is not possible to step back in time, audiences this fall will follow in the footsteps of the opera’s original Boston listeners – literally and figuratively. The date is January 3, 1879. You arrive at the grand Boston Theatre on Washington Street on this chilly Friday night, perhaps stepping out of a carriage, perhaps arriving on foot. The building’s façade is gorgeous, and it’s clear why this is considered the very best theater in the city. Some even say it is the best theater in the world. Since opening in 1854, it has been the city’s premiere venue for both opera and drama. Inside, you admire the beauty of the lavish space: it has seats for over 3,000 patrons, three expansive balconies, and an enormous glass chandelier. 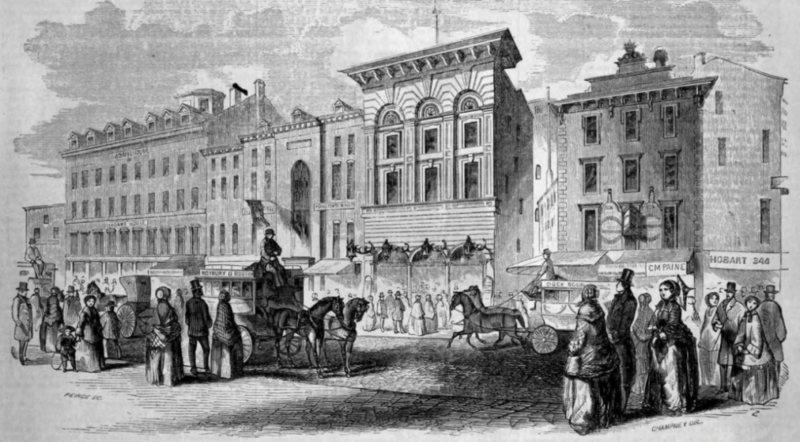 The exterior of the Boston Theatre, c. 1855.
Credit: Ballou’s Pictorial, 1855. Public domain. The interior of the Boston Theatre. Credit: Author and date unknown. Public domain. The star of tonight’s performance is the renowned soprano Minnie Hauck. She will be performing with Her Majesty’s Opera Company, one of the many traveling troupes who make regular stops at the Boston Theatre. Managed by the British colonel J. H. Mapleson, the troupe is in town for a two-week stint at the theater, during which it will perform not only Carmen, but also Il Trovatore, La Sonnambula, The Marriage of Figaro, I Puritani, Rigoletto, Faust, and The Magic Flute. Hauck is an international celebrity. 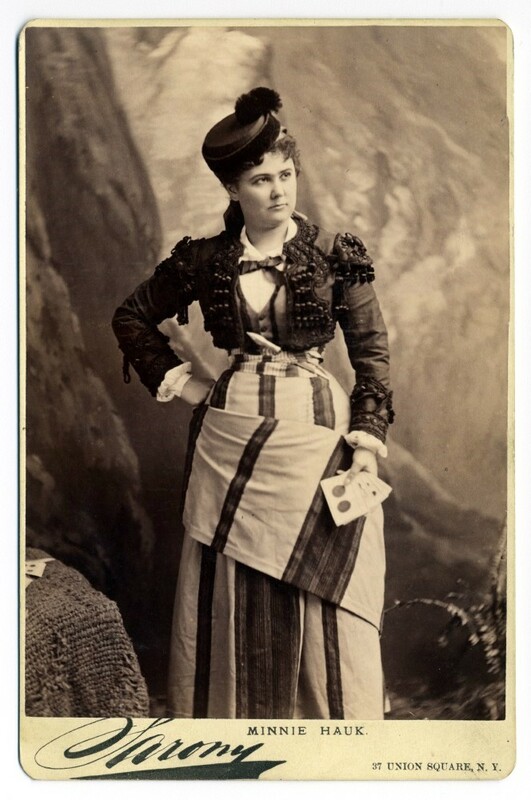 She was born in New York City in 1851 to a German American immigrant family, and she made her debut in opera at age fourteen. Her portrayal of Carmen is already famous: she sang the role at the opera’s British premiere in June 1878 at London, and at the American premiere in New York later that year. As one critic wrote after her performance in New York, “Minnie Hauck is Carmen.” Over the course of her career, she will sing the role more than 500 times in four different languages. << Minnie Hauck in a cabinet card photograph, c. 1880. Credit: George Eastman House Photography Collection. Public domain. At the beginning of the performance, you and your fellow audience members are not quite sure what to make of this new opera, which is unlike anything you’ve heard before. As the evening goes on, though, you become more and more enthusiastic. The performance concludes to fervent applause. Wholesome or not, Carmen has evidently become the talk of the town. Even if you’re not sure exactly how you feel about its exotic setting, scandalous storyline, and musical boldness, you are confident that it will be a work to remember.